See my modernism timeline here. This drawing is a reflection of modernism as well as the technological and industrial processes brought on by the Industrial Revolution. It features cubism and hard edges as was prevalent in twentieth century art and architecture as well as an emphasis on American Functionalism which dampened the era's architectural advances in the name of economic viability. The Pruitt-Igoe Housing project, which was located outside St. Louis, represented a symbolic end to modernism when the project was demolished in the 1970s. 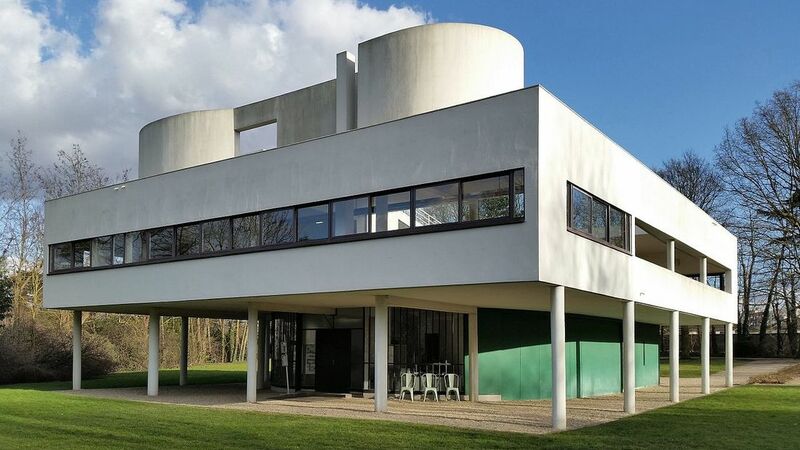 Prominent architects Phillip Johnson and Le Corbusier are featured in the portrayals of their Glass House and Notre Dame du Haut, respectively. Louis Khan is also acknowledged for his work which served as a transition at the end of modernism and into deconstructionism. 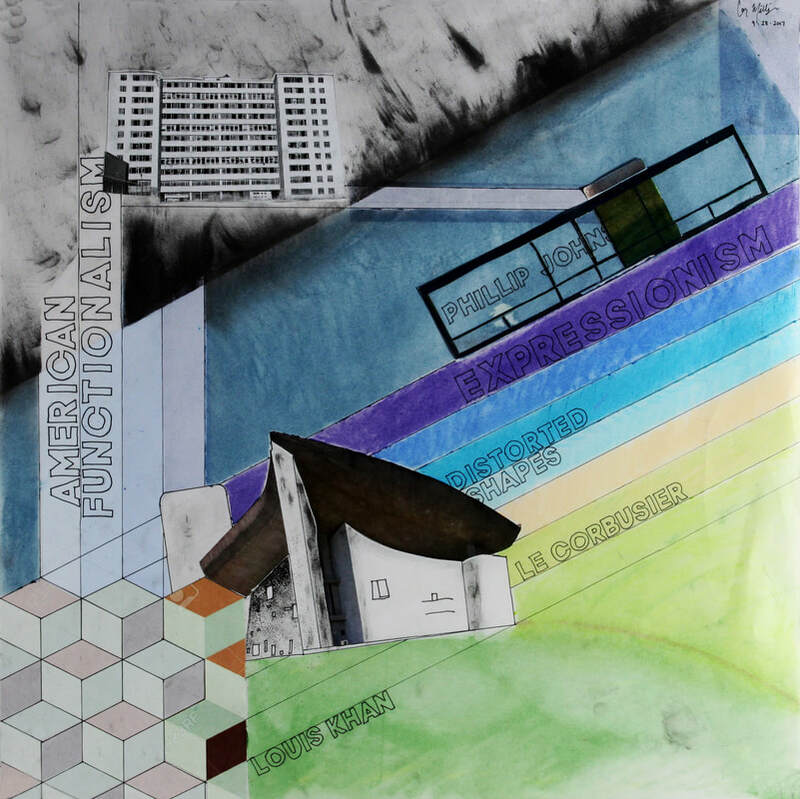 The above parti diagram (left) and floor plan analysis (right) are of Le Corbusier's 1929 work, Villa Savoye, which is the feature image at the top of this webpage. This work is definitive of several elements of modernism, including cubic design, utilization of natural lighting and cohesive public spaces, and a building which has a "form follows function" philosophy. Raqqa, Syria, pictured c. October 2017. Image in public domain. As the conflict with ISIS begins to wind down in Syria, millions of refugees are beginning to return to their hometowns, only to find their cities destroyed by landmines, airstrikes, or gunfire. Rebuilding these cities tasks architects with keeping an eye out for restoring the history of these towns, providing ample and culturally appropriate shelter for returning residents, and designing with economic viability and reproduction in mind. The Architectural Design I Studio was tasked with developing a tiny house with a building footprint of approximately 250 square feet for a family of four. See below for the design I chose to develop for a family returning to Raqqa, Syria. I crafted my initial designs on the idea that they should be ideal for an urban landscape and have an opportunity for expansion. I also wanted to choose a design which featured an outdoor living space, which would be culturally appropriate for the area. Option 3 proved to be able to provide the greatest modularity and applicability to the city. By the end of the design period, my concept emphasized the ability to freely move throughout the home and also the incorporation of space for storing items in a dignified manner. 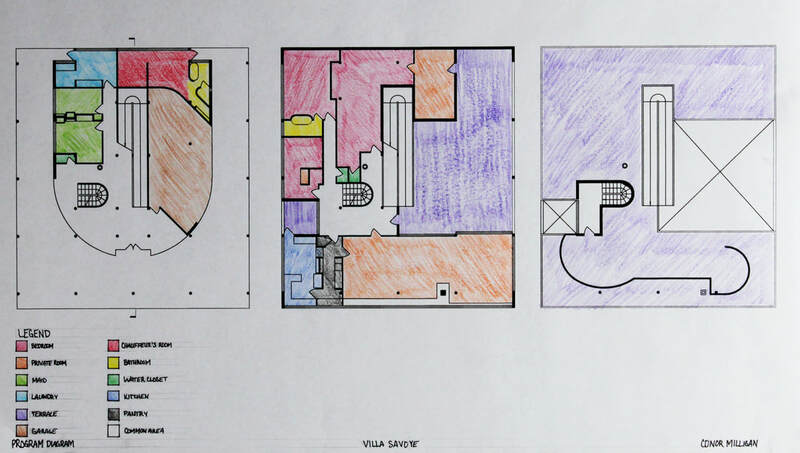 The first floor plan contains a dining and living outdoor/indoor space, as well as the full size bathroom and kitchen. There is also a storage closet for potential utilities, water storage, or propane storage. The second floor plan contains a pantry closet as well as a living area shared with an outdoor patio. The bedrooms are partial height walls of approximately 7 feet high, providing closure from the living space but not completely sealed off to preserve open air flow. The site plan will ultimately feature four adjoining units which create a plaza-style home of 36' by 36', as indicated by the dashed line inside the property boundary. However, the initial first unit will only cover a quarter of the built out space. Until a family acquires the financial means, the lot will remain uncleared rubble and a standalone quarter unit. The elevations pictured above side emphasize the use of an insulated concrete form (ICF) exterior, which is a style of concrete block which can be built using the surrounding rubble and provide insulation from desert temperatures. The bare side elevations are intentionally designed so that future adjoining units can be connected without the removal of window space.